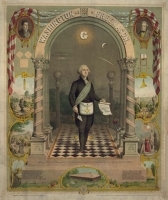 Did you receive anything attesting to your being made a Royal Arch Mason? 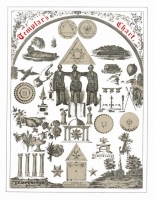 This is a rare opportunity to own a Royal Arch, Companion masonic record Personalized in calligraphy with your name and the dates you received your Cryptic and Royal Arch Degrees. Full of symbols! The original plate is from 1911 and has been fully restored. 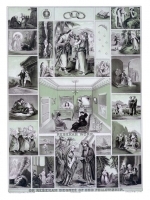 This is a highly detailed piece of ART that is printed on a high quality paper that gives the appearance of parchment. 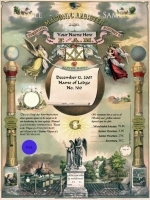 It is NOT black ink but a combination of black, blue and red that gives the certificate a very unique and antique appearance. It comes with a metallic foil Gold seal for your recorder to put the Chapter imprint/seal on it. 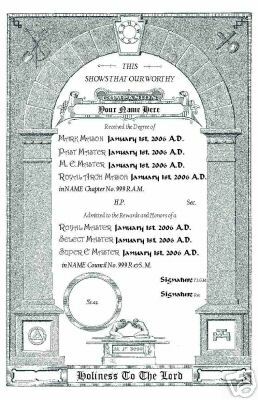 You must send the following as you want it to appear: Name, date of Mark Mason, date of Most Excellent Master, date of Royal Arch Mason, Chapter name and number, date of Royal Master, date of Select Master, date of Super Excellent Master, Council name and number. The spaces for the H.P., Secretary, TIGM and Recorer are for their signatures. If you prefer, I can fill in the names, just let me know.